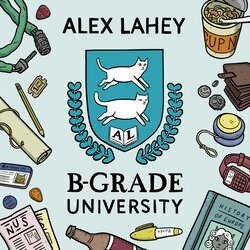 Celebrating what has been a whirlwind few months of success garnering her an abundance of buzz across the country and overseas, Alex Lahey is thrilled to announce the release of her debut EP ‘B-Grade University’, out July 29 through her new label Nicky Boy Records via Caroline Australia. Lahey hocked her beloved 1999 blue Corolla to pay for the recording of her EP Produced by Oscar Dawson (Holy Holy, Ali Barter) and the sacrifice is proving to be well worth it. With an overwhelming response to her infectious first single You Don’t Think You Like People Like Me, Alex quickly won over a new audience of fans. The success of the single saw Lahey score the highly coveted ‘Best New Track’ nod from Pitchfork, and in the same week she was named as recipient of the Josh Pyke Partnership award. Shortly after Alex snared the opening spot on the main stage of Splendour In The Grass for Triple J Unearthed. With a simple, home-spun story-telling style and knack for melodic, guitar-driven hooks, Lahey is set to release one of the most talked about EP’s of 2016 - bound to be the year’s greatest Corolla-funded release. Lahey sings about the reality of having to assimilate to the “Nine to five heartache" awash with melodic guitars.